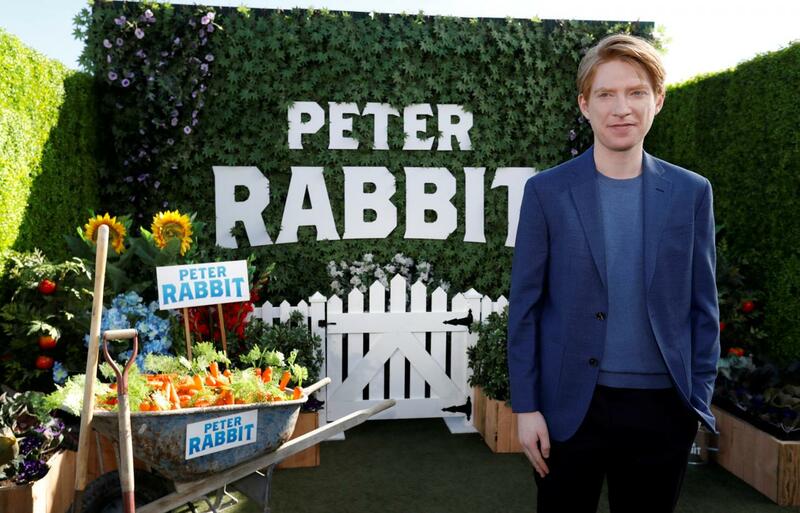 Home / Movies / Domhnall Gleeson Meets His Match in "Peter Rabbit"
Domhnall Gleeson Meets His Match in "Peter Rabbit"
British actor Domhnall Gleeson stars as the fussy landlord Thomas McGregor in Sony Pictures Animation's Peter Rabbit, the new family comedy which brings all of the audience-favorite Beatrix Potter characters to the screen in a brand-new, modern adventure. In the film, Thomas McGregor has risen through the ranks of London’s famed department store Harrods, working diligently – some might say obsessively – towards the post of Associate General Manager, only to find that the position has gone to a man who doesn't deserve it. When he inherits the McGregor manor (and its attached vegetable garden), Thomas sees a chance to sell it in order to finance his own toy shop. A man who wants everything neat, tidy, and in its place, Thomas is about to meet his match in Peter Rabbit. Two somebodies, actually – there’s Bea, the sweet and generous next-door neighbor who sees something in Thomas, and then there’s Peter, the rabbit who turns his garden (and his life) upside down. In fact, at the beginning of the film, Thomas’ motivation is centered around revenge. “He has been swearing to himself that he would find a way to get back at Harrods,” notes Gluck. “When he finds out he’s inherited the manor, he sees it only as an opportunity to fix it up and sell it, to make enough money to start his own toy shop.” It’s no surprise that when Peter begins to make a mess of the garden, he similarly begins a vendetta – no matter how crazy that is. In Peter Rabbit™, the mischievous and adventurous hero who has captivated generations of readers now takes on the starring role of his own contemporary comedy. In the film, Peter’s feud with Mr. Thomas McGregor escalates to greater heights than ever before as their fight to gain control of McGregor’s coveted vegetable garden and the affections of the warm-hearted animal lover who lives next door (Rose Byrne) extends to the Lake District and London.